First of all, if you want professional pictures taken I recommend you reach out to your photographer and talk about a time frame and their availability as early as when you 1st make the announcement that you are pregnant. This will prevent you from not being able to work with your 1st choice photographer due to scheduling issues (they are already booked out). This will also prevent you from looking for a photographer at the last minute. I am a photographer, but also expecting. 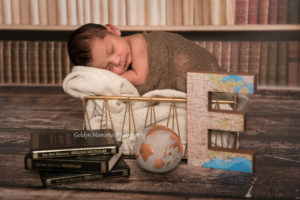 Now, being on the other end as the Momma wanting Maternity pictures, I will tell you that I personally reached out to my photographer about 4 months in advance to ensure he was available on the date I wanted to take my pictures. I never had professional maternity pictures taken during my 1st two pregnancies….and I still regret not doing it. So this time around I had a plan! I have always recommended between 32-36 Weeks Pregnant is the Best Time to take Maternity Pictures. Between 32 and 36 Weeks Pregnant you should have a nice bump to show off during your photo shoot. However, this timeframe truly depends on how your pregnancy is going, how you are measuring and how you are feeling. Things change so quickly during pregnancy! You want your Maternity Photo Session to be memorable….and not in a bad way. You don’t want to remember how you felt swollen and awful during your session, or even worst, that you didn’t last the entire session and had to stop early from pure exhaustion (this has happened!). Worst case scenario, you deliver your baby a few weeks early and never get your baby bump pictures taken at all! As an example, my amazing husband took these pictures of my baby bump at 28 weeks pregnant. I am so happy with how they look and turned out….but now that I am currently 35 weeks along my belly bump has grown so much and looks different. Luckily for me these pictures were just for fun and to document how I looked. It was only 17 degrees outside….so we only took pictures for about 6 minutes in our backyard. I will not forget this day! My husband took pictures of me during Super Bowl Sunday while our boys played in the backyard in the snow. 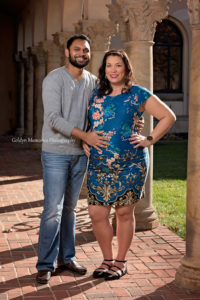 I am excited that last Saturday I was blessed with amazing weather and I was able to complete my Outdoor Maternity Photography Session with my friend Oscar with Oscar Pedroza Studios. I will say that being 35 weeks pregnant and taking pictures took a lot out of me. Not to mention we took pictures with our family (2 boys ages 4 and 5) and my husband. Don’t get me wrong, the session was absolutely amazing, but my body was just so exhausted! Here’s the thing. If you have the pictures taken too early then you are not going to really have your “True Bump.” If this does not matter to you than go for an earlier session (28-30 Weeks). If you wait too long to take your maternity pictures you may be uncomfortable, swollen, feeling more fatigue or even go into labor early and not have pictures taken at all. You need to consider all of this when scheduling your session. Not to mention if you want outdoor photos, keep in mind rescheduling due to weather! Remember- every woman is different and every pregnancy is different. Many unforeseen things may happen at any time throughout your pregnancy, whether it is your 1st or your 5th pregnancy. 1. Contact Your Photographer as early as possible to schedule a tentative date for your Maternity Session. 2. Book your session between 28 weeks and 36 weeks pregnant. 3. Communicate with your photographer with any changes – possibly moving your session up a couple of weeks. There is nothing more exciting than having a Client that calls upon your photography skills for Milestones in their lives! I met Danielle back in 2009 when I lived in Las Vegas and she lived in Kansas City, MO. We met through my best friend and we just hit it off and continued our friendship through living in different countries. Danielle moved to Abu Dhabi and worked at an International School as a teacher. This is where she met the love of her life, Shijil! The two then packed up and moved back to Kansas City, MO. Meet Shijil and Danielle! The first time I ever met Shijil was on his Wedding Day in July of 2016…. of course I was their photographer! They are just a stunning couple! Not only stunning, but funny, down to earth and just an overall fun couple to be around. After Shijil and Danielle were married they continued to enjoy life and travel out of state and out of the country. In 2017 they announced that they were expecting! Danielle then called me to photograph her Gender Reveal with her family. To say that this was an emotional day was an understatement! Health wise Danielle’s father was not doing well. So we just photographed the reveal in their backyard. People in attendance were Shijil, Danielle and her Mother, Father and Brother. Danielle’s friend prepared a box filled with balloons, so it was even a surprise to me when blue balloons popped out of the box! Congrats! It’s a BOY!!! This day is bittersweet and a day that no one will forget. 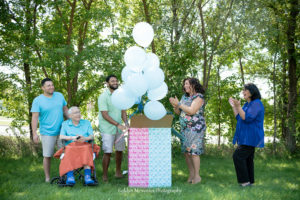 The excitement of finding out Shijil and Danielle were having a baby boy was overwhelming in itself. The day did not end as anyone had planned. Danielle’s father passed away the same day he found out his daughter was having a baby boy. 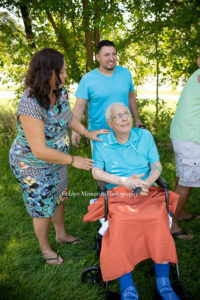 It was wonderful that I was able to capture the excitement and happiness of the gender reveal, but at the same time words can not express how devastating it was that my friend lost her father just hours after our fun photo shoot. The next photoshoot scheduled was naturally to capture the Milestone of Danielle’s 1st Pregnancy! We scheduled her Maternity session outdoors in November. It was super cold out, but you can not tell by the pregnancy glow on this gorgeous 1st time Mom-to-be! Fast-forward to December 26, 2017….baby Eashan was born at 11:56 PM weighing 9 lbs and 23 inches! I was able to meet baby Eashan when he was 18 Days Old! He is perfect in every way and I am so proud and happy for my dear friends that now have a mini-me travel buddy to spoil! 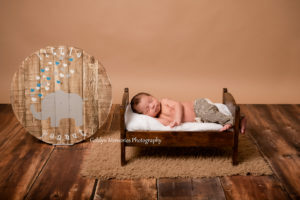 Danielle’s father shared with her family that he had a dream and he was calling his new grandchild “Little Peanut.” While Danielle was out shopping she found this beautiful wooden wall art with “Little Peanut” written on it. How perfect! She brought it to the session and we incorporated it into one of the images. A huge thanks to Shijil and Danielle for trusting me to capture all of the Milestones in their lives! It is an honor to work with both of you and call you my friends! 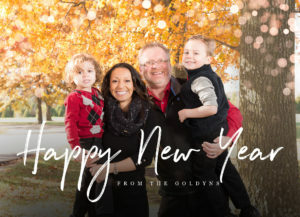 For many people January is a time to set “New Years Resolutions.” After wrapping up a busy Holiday Photography Season in December I always look forward to January. For me it is the best time for me to take a break from photo sessions and really self-reflect and evaluate what is important to me and what I need to improve on. During this month I think about what didn’t work last year. I review my sales, costs and I typically re-evaluate my pricing structure. Whether we call it “New Years Resolutions” or Goal Setting…it’s really the same thing. January is full of new beginnings. It’s a time to start fresh and set goals and objectives in anticipation for a prosperous New Year. I always share my Photography Goals with my number one supporter- My Amazing Husband. I trust him and I know he wants me to be successful. He helps hold me accountable for my goals and accomplishments for the year. This year I am doing something different. I am really jumping out of my comfort zone by doing this, but I am going to share My 2018 Goals for My Photography Business with everyone willing to listen. Why? I really think by doing this it will help me stay focused on what my objectives are for the year. Plus I know that once I achieve my goals it will be much more rewarding to share with everyone! When goal setting for my business, I try to keep a few things in mind. I self-reflect to identify what makes me happy. What photo shoots did I have the most fun at? Which ones were the most memorable? As a business women I also reflect on what was most profitable. You don’t necessarily have to wait until January to identify your goals for the upcoming year. For instance, I had My Top 5 Goals Set in my head back in November. Last year during my busy season I finally admitted something to myself that I have known since 2014. 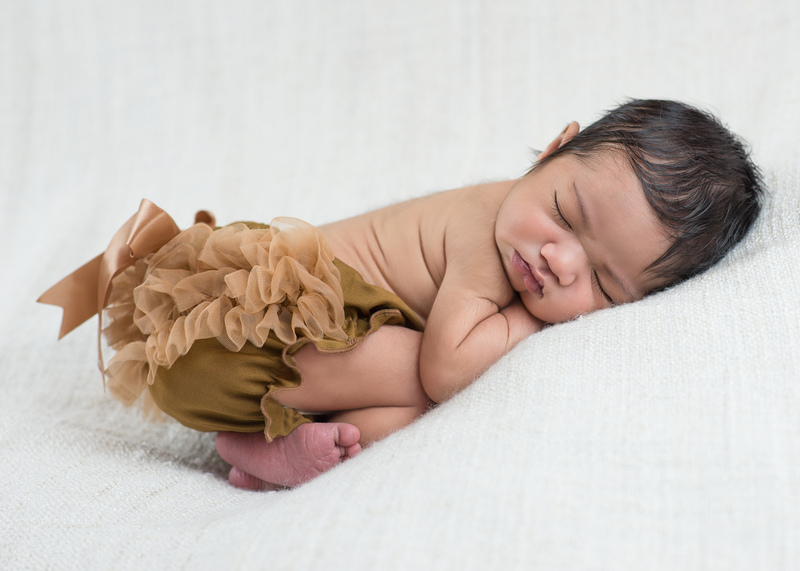 My photography passion is photographing Newborns, Babies and Children. Don’t get me wrong, I enjoy photographing different genres, but my passion is Newborns, Babies and Children 100%! One of my biggest fears besides going to the dentist has always been “Failure.” But you know what? Failure only leaves room for me to grow and get better! I know it’s not easy for some to share goals with others with fear of failure and for everyone to know you didn’t accomplish your goal. But let’s get out of this mindset! If I can do this, you can do this too! When creating your list of goals keep in mind that the goals set must be measurable in order to see if you achieved them at the end of the year. Setting your goals is the first step. Then you need a plan of action on how to achieve them. You may even add to your list of goals through out the year. Whether you keep a planner, post on social media or just verbally tell your friends and family…..I challenge you to share your Top 5 Goals for the Year!!! Now onto You! What are your Goals for 2018??? 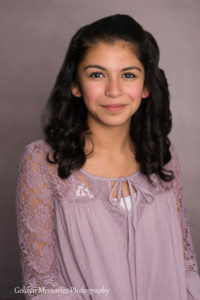 Let’s talk about Studio Headshots! 1st of all, if you are prepared and communicate to the photographer what your expectations are, then your session should be pretty quick and painless! 1.) Exfoliate your face and neck. Depending on your skin type you may do this 1-2 days prior to your shoot or even the day of. Your Headshot is going to be a close up, so you really want to have great looking skin during your shoot. 2.) If you wear glasses but do not plan to wear them during your Headshot Session, remove them 10-15 minutes prior to your session to help get rid of the red marks the nose piece of the glasses normally leave on your face. 3.) Decide whether you are going to hire a professional make-up artist and hair stylist. This will need to be scheduled in advance. 4.) If you are planning on doing your hair and make-up yourself, do a trial run to make sure you know how you are going to wear your hair during your shoot. Curls always help create more volume and really helps disguise those pesky fly-aways! 5.) Wear a top/dress/outfit that you are not only comfortable wearing, but one that you feel confident in! It’s hard to believe that these two little guys were born in the Sunny State of Arizona! We now live in the Four Season State of Missouri. It’s so different and awesome having the Four Seasons! I didn’t realize how much I missed this until I moved back! We wished for a “White Christmas” and we actually had one….but the boys were sick with the flu so they had to enjoy the snow from indoors. It was so difficult to explain to them that they were too sick to go outside to play in the snow. So when we woke up last Sunday to a snowy morning it was just perfect! Nothing better than having a fun snow day on the weekend! Last Year My Father took me shopping to help get the boys ready for Winter. We picked out some snowsuits, coats, gloves and snow boots for the boys…..luckily they still fit them! After what seemed to be an hour, but really only 10 minutes, of getting all of our gear on we headed out to the front yard to walk around every square inch of snow in the driveway and yard. 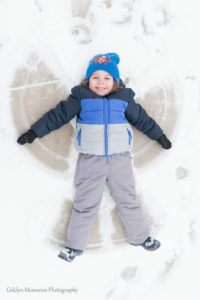 The Goldyn Boys enjoyed some brotherly snow ball fights, running in the snow, throwing the snow up in the air and they even made snow angels! As a Mom it was just spectacular to see the excitement in their faces to be outside playing in the snow. 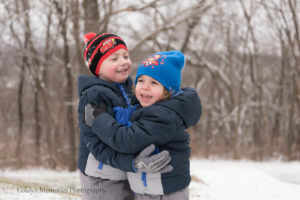 I am so happy that I took my camera outside to capture these awesome images of the boys’ 1st Snow of 2018! 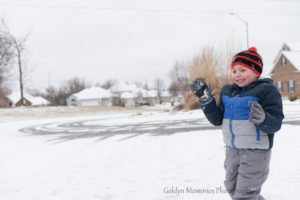 Our 1st Snow was filled with excitement, rosy cheeks, smiles and lots of laughter! To my surprise, we were actually outside for quite a while before heading in to warm up. Sometimes our best times together are unplanned! This will always be a day I will remember! 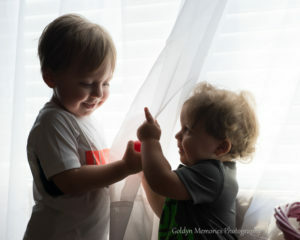 Meet The Goldyn Boys...my pride and joy and the reason I started my photography business. Since becoming a Mother in 2012 I felt the need to capture different stages of my son's life to share with loved ones and simply for me to just have to remember myself. Living in Arizona away from all my Family (that lived in Missouri) and with a Husband that traveled for work every week I felt like it was even more important to capture special moments to share with them. After having my second son in 2014, with the encouragement from my dear Husband, we took the plunge and we bought my 1st DSLR on Mother's Day 2014. It was a Nikon D3200 with two kit lenses. Oh I loved it and watched 1000's of hours of online videos to learn how to use it in manual mode. I then purchased inexpensive continuous lighting and a backdrop stand and started practicing on my two sons as much as I could. I practiced both in my make-shift studio and outside. I had many frustrating moments trying to get my tiny models to not move and to get the camera settings just right. Being a perfectionist, I quickly learned that it was time to upgrade my camera and lens. Since 2014 I have purchased 2 Full Frame DSLRs, 3 Fixed Lenses and 2 Zoom lenses. In addition I have purchased proper studio equipment and outdoor OCF. With continuous online research I have made purchases to help my business grow and my photography skills and images have improved 1000%. I am proud of how my business has grown, even with moving out of state and starting all over with building my clientele. I am most proud of my boys and my lovely husband for giving me time away from them to work on my business.